Some time ago I wrote about fixing up an old, well-loved quilt to extend its life a bit. It belonged to my DH, made by his grandmother when he was just a kid. This weekend, I was called upon once again to perform some rehabilitation on a much-loved quilt. This time it was one that I had made many years ago for the son of my BFF, when he graduated from high school. Full of apologies for its condition, my friend told me that he has used it constantly for all these years. After all that use, and all those washings, the binding was completely worn out, and some other repairs were needed.They were reluctant to wash it again, for fear that it would simply disintegrate! It would mean a great deal to him if I could repair it so he could continue using it, she explained. Naturally, I agreed to do whatever was necessary to fix it for him. When we opened it up, I was struck by how incredibly soft and cuddly it was. You just had to scrunch into it, and feel that velvety, softly-textured surface against your face. The binding was indeed worn out, completely gone in some places; but I noted with some pride that while the fabric was ragged, my careful hand-stitching holding it to the back had held firm. After trimming off the old binding (I should say, what was left of it…), the new one went on. … then flipped and machine-stitched it to the front. Done much faster! There were a couple small holes on the back that needed a patch, to prevent them from getting any worse. As luck would have it, I still had a piece of the original backing fabric in my stash, and was able to locate it in under a minute – the advantage of keeping my stash reasonably well-organized! You can see how much it has faded over time. My friend kept thanking me for my efforts, so I told her what I think most of us quilters would: it was a genuine pleasure to rescue this quilt. The fact that it was so worn meant that her son had loved it, and used it in exactly the way I had hoped he would when I gave it to him all those years ago. There is no higher compliment to a quilter than to see something she made used until it’s used up. It gave me joy to make it in the first place, and gave me joy again to repair it, and return it to the wonderful man her son has become. He looks happy to have his quilt back, don’t you think? Stay warm, Chris! A couple days ago, I delivered a quilt to a longarmer. While it’s there, I thought I’d prep the binding, so it’d be ready to go when I got it back. Then I did the math… 404 inches. Ten width-of-fabric strips. MORE than 11 yards. 11 Yards. 33 feet. 10 meters. How big is that? which is actually only 10 yards, but that’s pretty close. A few minutes on Google revealed many other items. This tape measure was much too easy. An old Detroit city bus is the same size as the dinosaur – coincidence? Cloud Gate (aka The Bean) is 33 feet tall. Finally, the thing that got all this started? The BINDING for a KING-SIZE QUILT!!! When it comes time to flip that binding, I just might be looking for that roll of electrical tape – stay tuned for a new tutorial on “New techniques in Binding!” LOL!! (idiomatic) To produce something refined, admirable, or valuable from something which is unrefined, unpleasant, or of little or no value. I began the new year with a goal of cleaning up my overflowing, long-neglected batik scraps – unrefined for sure, but great raw material. One big bin and a couple of bags, bulging with yummy leftover chunks from batik beauties of many years past. Wrinkled, messy, and no longer able to close the lid on the bin – time to dig in. One handful at a time, I sorted, pressed, and trimmed. I expected the level in the bin would go down. Funny though, the more I dug through the pile, the more it fluffed up – instead of shrinking, the mess seemed to grow, for a while anyway! Getting the scraps in order was just the first part though. What’s the point of having a great stash if you don’t actually USE it? I found a super-easy pattern on Bonnie Hunter’s Quiltville that was perfect for these scraps. If you have not discovered this site yet, go there RIGHT NOW!! 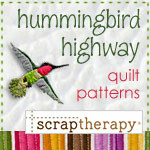 Full of tips about the smartest ways to cut and use your scraps, and lots of free patterns. Bonnie is the Scrap Queen! Here are the pieces I’ll need to make my version of her Bricks and Stepping Stones quilt: There’s 300 bricks and 300 dark/light 4-patches here – enough for a queen-size – all from that overflowing scrap bin. No new fabric, all scraps from that bin. How about that!? I’ll be putting it together over the next couple weeks, so watch for the next update. That pile of sow’s ears is turning into a beautiful silk purse – er, quilt top! As we ring out 2016 (I’m not sorry to see it end! ), and begin a new and hopefully better 2017, I’m looking back at progress towards my goals, and taking a moment to be grateful for my many blessings. My 2016 goal of twelve UFO finishes? Well, I came pretty close; much closer than I would have, had I not set it down firmly in my mind and in writing! I have fewer UFOs on the shelf, and a satisfying sense of accomplishment. I am grateful to have had the time, energy, good health, and skill to complete all these projects. Finish number 10 was this late entry, made from an orphan block. It was supposed to be part of a English paper-pieced hexagon sew-along. Should have been right up my alley, right? Wrong. The pieces were HUGE compared to what I have been doing, making the fussy-cutting I love impractical. I made this one block, and part of another, then moved on. It made a really nice pillow for my best friend’s new apartment. She has been my BFF for almost 50 years, and I am forever grateful for her continued presence in my life. I am beyond grateful to be part of a loving, growing family. The world lost so many special people in 2016, but we gained so many too – who knows what kind of people the babies of 2016 will become, what greatness they may achieve? And my final UFO for 2016, finish number 11, actually ran over into 2017 by just one day. How nice to begin the new year with a real feel-good project! I came across a kit given to me some time ago by my friend Doris, the wonderful woman who runs “The Quilt Cupboard.” That’s the charitable arm of the Squanicook Colonial Quilt Guild of Pepperell, MA. Doris stores and organizes donated materials in her cozy basement workroom, distributes them to guild members for making tops, and passes the tops along to others to quilt and bind. Finally, and best of all, she makes sure that the completed quilts are given out to those in need in the community. Dozens and dozens of quilts every year, to families and individuals dealing with illness, injury, or loss. The kit contained a handful of blocks in shades of purple (someone else’s UFO, I suspect) and some chunks of fabric. I made a bunch more nine-patches and friendship stars with bits from my stash, and added a couple borders. Notice that unusual corner treatment? Courtesy of a math error flash of creative inspiration, LOL. I’ll send this off to “the cupboard” soon, so Doris can get it quilted and donated. This past year may have been bleak and difficult on the surface, but you really don’t have to look very far to see that there is still a LOT of good in the world. I’m grateful for the ability to contribute to it in my own small way, and for people like Doris, and for all the quilters in all the guilds who believe that small acts of kindness can make a difference, one warm quilt at a time, to each grateful recipient. Have a Grateful and Happy New Year. Finish number eight was this year’s camp quilt project. As I have mentioned, each summer, I take all the stuff for one major project to camp, so I don’t have to schlep it back and forth every weekend. For this summer’s project, I chose Wonky Teacups, which I started over ten years ago. The pattern (actual title “We’re allowed ten minutes for tea”) is by Australian pattern and fabric designer Jan Mullen, and it’s available on patternspot.com. Funky, wild, bright – what’s not to love?! Way back when, I had made just a few of the many cups, plates and jugs, and had amassed a sizable stash of the loudest geometric prints I could find. The piecing is improvisational, and totally forgiving – perfect for the casual attitude I take when camp-quilting! It was lots of fun watching it take shape as more and more sections began to fill up the design wall in my tiny camp sewing nook. As soon as it was done, off it went to my friend Linda, a longarm quilter. She used an edge-to-edge design that looks like steam rising from the cups – a great choice! And now it is hanging in my studio, in place of the useless and annoying sliding closet doors. Turns out it was the perfect size, and could not have fit better if I had planned it that way! And number nine got finished while I was on a retreat with some friends at East Hill Farm In Troy, NH, overlooking Mount Monadnock. The view was great, still showing some color after a glorious foliage season. This project was the 2013 block-of-the-month from my favorite LQS, Quilted Threads in Henniker, NH. I had done 11 of the 12 blocks. After deciding how I wanted to do sashing and borders (NOT following the pattern, of course…), I found that I needed more of the background fabric – and thank goodness, my LQS came through for me! YAY!! The background is actually a deep eggplant purple. Not a great photo, but you get the idea. It sets off the bright, saturated colors in the blocks beautifully, and is so much more interesting than plain old black would have been. And it’s just a “flimsie” – an unquilted top – because that’s as far as I planned to go with it for now. So while it’s not DONE-done, I’m calling it a UFO finish-for-now. My goal, my rules, so don’t judge, OK? Now, I’m not kidding myself. I’m not going to get three more UFOs done between now and New Year’s. My goal of twelve was rather ambitious. But I might make one more happen, for a nice even ten – a round and healthy number that I can be proud of. Did any of you set a goal like mine? If you did, leave a comment and let me know how you are progressing. Sharing our intentions and our successes is good for us all! Thanks for stopping by – Happy stitching!